Did you know that beavers are the largest rodents, or gnawing animals, in North America? Though beavers used to inhabit many places throughout North America including Mexico and the North Arctic Regions, they now live primarily in northern-forested regions around the world. 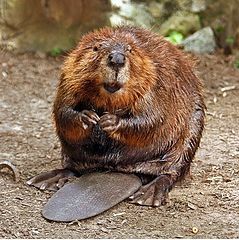 Beavers are unique rodents because they live both on land and in water. With special features like waterproof fur, big paddle-like tails, and webbed hind feet, this species is equipped to live in these two individual environments. In fact, using their tail like rudders, beavers can even stay under water for up to 15 minutes. While underwater, they maintain their ability to see because they have inner eyelids that close over each eye. Beavers are also a distinct species because of how they build their homes, which are called “lodges.” Often as tall as five feet, lodges are built of mud and dry leaves. They also have two entrances. One of these is underwater, which allows beavers to access their homes despite winter ice. Beavers protect their homes by crafting dams that block out water and therefore prevent the lodges from being washed away. In just one week, a family of beavers can build a dam that is 30 feet long. Typically reproducing two sets of babies called “kits,” beavers form cooperative, family-oriented colonies. Kits learn to swim when they are only one month old. Next time you are near a northern body of water, see if you can spot a beaver and its family!